It rained on Saturday. Not the type of apocalyptic storm that DC’s extreme heat and humidity usually brews up on summer evenings, but a slow and steady grey rain all day long. And we welcomed it. After a week of blistering temperatures and swamp-like air with heat indexes over one hundred degrees, we were happy to hunker down in the apartment and listen to the rain tap the windows. We played games, ordered food from the Afghan restaurant up the street, and quietly whiled away the hours. But then I started cleaning. At first I was planning to scrub the kitchen counters and floors and move on with my day. But somehow I found myself taking everything out of drawers and off of shelves, wiping down every service and rearranging pots, pans, and utensils. One thing led to another and by the time Sunday came and went, I was shuffling around the apartment on my knees, cleaning the baseboards with a rag. Even the floor of the front hall closet had been mopped. In case it isn’t clear from my description, this cleaning binge was epic and completely exhausting. So, obviously I needed plenty of fuel to sustain my gruelling dusting and sweeping routine. And I didn’t have the time or inclination to do any epic cooking. But luckily I had spinach and eggs in the fridge and the most amazing Popeye-worthy recipe that takes no more than ten minutes to make. And it’s awesomely delicious. So the next time you have a hankering to go on a cleaning rampage, I highly recommend you stock your cupboard with the ingredients below. Remove any tough spinach stems. Add ½-inch water to a pot and bring to a boil. Add spinach and stir constantly until the spinach collapses entirely, about a minute. Drain spinach and run cold water over it until cool. Spin-dry very well in a salad spinner, or press-dry in a clean kitchen towel. Finely chop the spinach. Heat oil in a large skillet over medium-high heat. Stir in the garlic and cook for about a minute, without letting it brown. 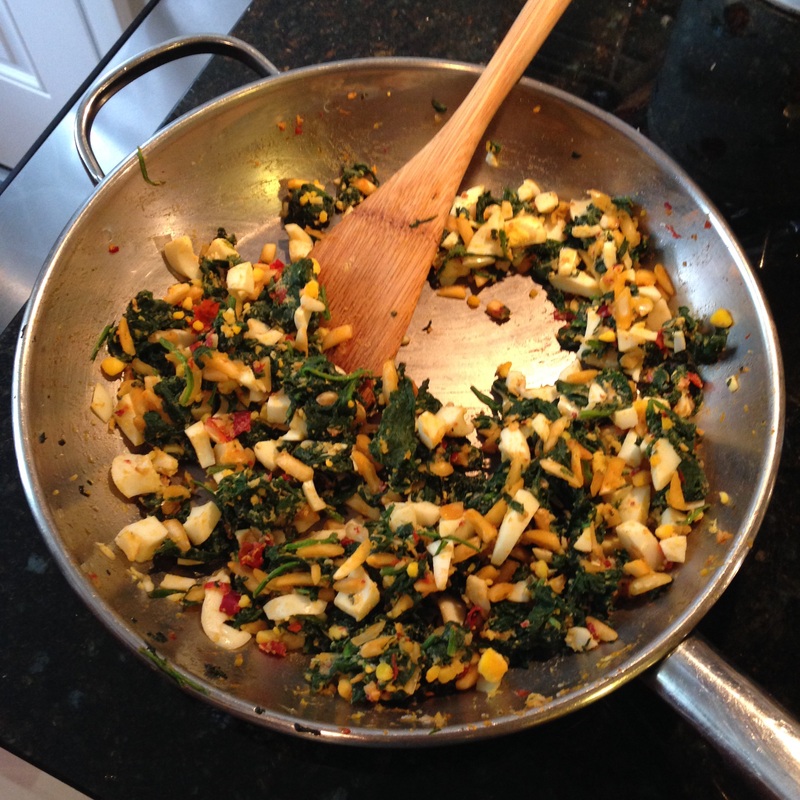 Remove pan from heat and stir in harissa and spinach. Add eggs, almonds, salt, and lemon zest and stir again gently to combine well. Serve warm or at room temperature. Serves 4. Tags: eggs, fast, lamb, middle eastern | Permalink. This looks great, Sarah. I make something similar but add tofu. Yum !